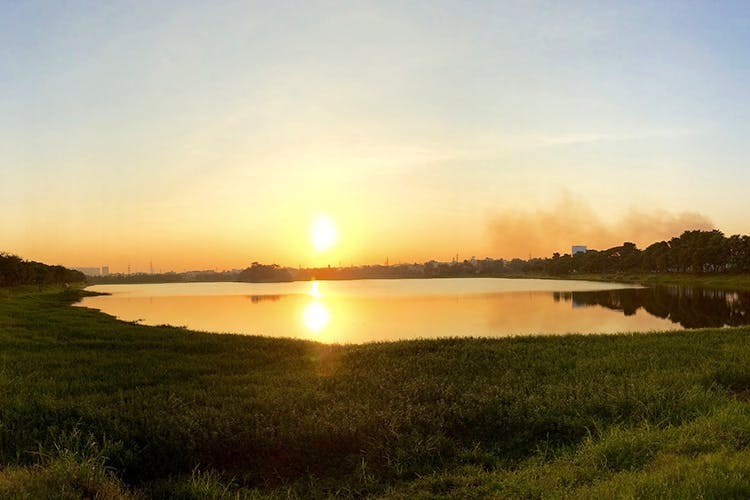 The Agara Lake's restoration is complete and with it comes a beautiful spot in the city for morning jogs, cycling, bird watching, and kids to play about. After restoration, it's a spot of fresh air and green space for anyone who loves the outdoors. Plus, the cycling track and jogging track goes around the entire lake which comes to around three-four kilometres of a solid cardio session. Workout scenes sorted, right there and that too with a view of the freshwater lake and the green foliage all around. If you are entering through TheIbbalur Junction side entrance, don't miss out on the park. It comes with a kid's play area and a viewpoint for some photography sesh. For folks living this side of the town, that is, Koramangala, HSR, Sarjapur, and BTM, the lake is like your own personal Ulsoor Luke or even Cubbon Park. Hit up the jogging trail or go on a walk around the lake. The park is a nice spot for a picnic with the kids. Just remember to clean up afterwards. There are plenty of benches all around too. Look out for the multiple viewpoints around the trail. Plus, working and clean toilets for the win! Oh, and there's parking facility too. People should really use the cycling trail for cycling and the jogging trail for jogging and not mix it up. If you don't have a cycle of your own, make use of the lake's cycle rental service.